In front of the Aiguille du Midi cable car, the famous gateway to ski pistes, summits and legendary slopes, is the unique location of the 4-star Heliopic Hotel & Spa, which offers extraordinary stays at the foot of Mont Blanc. At the centre of the ski resort is a rejuvenation and well-being destination in a cosy setting. Wooden architecture, luxury rooms and a NUXE spa with a sauna and pool make this 4-star hotel a perfect retreat for enjoying winter sports and summer activities to their fullest. In summer, Chamonix and its surroundings offer a surprising change of scenery. Relax, unwind and take the time to enjoy the magnificent Mont-Blanc Massif. Discover all the richness and originality of summer activities that offer a true escape to the great outdoors. With incredible thrills to be had during a day of high-alpine sports, or live music for night owls looking for a great time out, and all of it in a vibrant, yet peaceful environment, you’ll be surprised by the blend of energy and serenity. Discover the magnificent landscapes and snow-capped peaks of the Mont Blanc Massif in a winter setting. Enjoy the many different winter sports activities and après-ski spots. In the heart of the Alps, the authentic ski resort in Chamonix offers all of the delights that this legendary area is known for. Whether a casual skier or die-hard enthusiast, the 74 miles of pistes in the valley offer everyone a passionate mountain experience. When night falls, grab a drink and enjoy the festive bar atmosphere in the centre of town. Discover a refined place for your next holiday in Chamonix Valley. 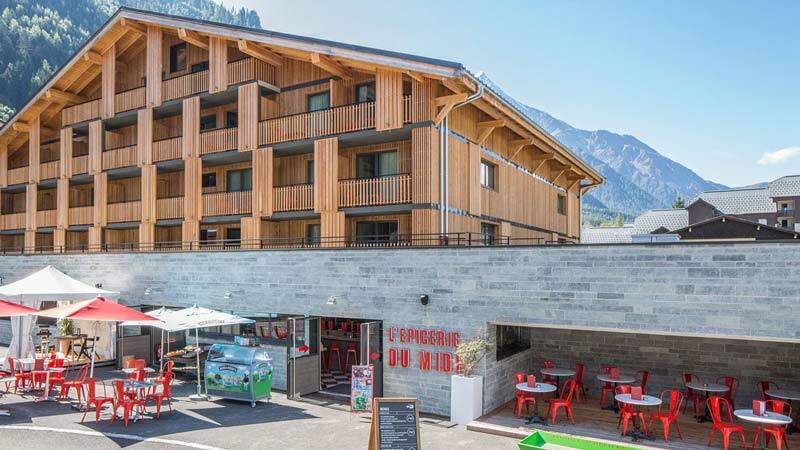 Perfectly located in the heart of Chamonix Mont-Blanc, right in the city centre, Heliopic Hotel & Spa is the ideal haven for winter sports and summer activities in the Alps. Its elegant setting and quiet atmosphere make it the perfect place for nature lovers. Located in the Chamonix Valley, our 4-star hotel promises you an unforgettable stay at the foot of Mont-Blanc. You are steps away from the ski slopes and hiking trails. Our hotel is very easily accessible from Chamonix - Aiguille du Midi SNCF train station. It is also just a few feet from the Aiguille du Midi cable car. Composed of two 4-storey chalets, our 4-star hotel in Chamonix offers a spectacular view of the valley's mountains. Its architecture, designed by Jean-Claude Descombes, perfectly combines authenticity and modernity. Here, noble materials, such as stone and wood, come together to create a warm and cosy atmosphere in each accommodation. Inside, soft colours make your room or flat a true cocoon. Imagine the charm of an attic room, trimmed in wood with a view of the mountains: the perfect chalet-style for your stay! Each room is designed as a cthosy nest. Some can accommodate up to 4 people. By yourself, as a couple or with your family, put your suitcases down in a comfortable and elegant space. Bright and trimmed with warm wood, our rooms promise you restful nights after a beautiful day outdoors. Cosy atmosphere, soft colours, high quality bedding: everything has been carefully designed down to the smallest detail to offer you a quality stay. We recommend our flats designed to accommodate 2 to 7 people for large families, groups of friends or couples looking for a little more space. You’ll feel right at home as soon as you walk through the door. All flats have an equipped kitchen, a living room and all the equipment necessary for your stay in Chamonix Mont-Blanc. They also have a ski storage room with lockers and boot dryers, as well as a laundry room on the lower level. At the end of the day, take advantage of the Hotel’s NUXE Spa of 500 sqm or enjoy your own private sauna or hot tub (available in some apartments). Total bliss after a day spent on the slopes or on the hiking trails! Our hotel in Chamonix has many common areas where you will have the opportunity to meet up and relax at the end of the day. Enjoy the cosy atmosphere of our bar at any time of day to have a snack with your family or share delicious cocktails and tapas with your friends. Meanwhile, the Akashon restaurant invites you to enjoy its delectable dishes concocted by our chef. In the meantime, your children will have fun in the play area. Big kids will love our virtual reality corner and our giant chessboard! Finally, our NUXE Spa invites you on a sensual journey for a well-deserved break. Enjoy the benefits of our ice cave, hot tub, cold water bath, steam room and sauna. All year round, our Heliotherapy program will be conducive to relaxation. Take the opportunity to give your muscles a massage or indulge in one of the many treatments provided by our NUXE spa therapists. Our 4-star hotel offers services to meet your needs. To allow you to stay connected with your loved ones or to check your work emails, we offer you free Wi-Fi and an Internet space. You will be able share the most beautiful pictures of your stay in the Chamonix Valley or your prowess on the slopes. Want a cosy evening with your partner or with your family? Many movies are available in your room thanks to our free VOD service. Skiing requires a lot of energy, so recharge your batteries with each meal thanks to our various dining options. Breakfast, half-board or à la carte: it's up to you to choose the meal option that will satisfy your appetite. In winter, the skishop allows you to book your ski equipment directly online or upon arrival. Located in the heart of the Northern Alps, the Chamonix Valley has breathtaking scenery for outdoor activities. Not to mention that Chamonix Mont-Blanc is one of the most beautiful ski resorts in the Alps at the foot of Mont-Blanc. By taking the tourist mini train, you can reach the Aiguille du Midi to witness the highest peak of the Alps or admire the Mer de Glace glacier in Montenvers. In winter, ski in the heart of beautiful snowy landscapes. The Chamonix Mont-Blanc ski resort is a legendary destination for ski and snow lovers. From the Brévent pass to Les Grands Montets via La Flégère, each slope will be an opportunity to admire Mont-Blanc. Apart from skiing, enjoy other sports such as snowboarding, telemark skiing, snowshoeing or cross-country skiing. In summer, the snow gives way to a green and flower-filled setting. Only the highest peaks are still covered with snow. Hundreds of kilometers of hiking and mountain biking trails dot the mountains. Thrill-seekers will be tempted by canyoning or rafting. And the walls of the cliffs will be perfect for rock climbing and via ferrata lovers.